The collection of short stories of Jesus’ Son is something of a paradox. The graceful and poetic language portrays dark and depressing situations occupied by people at their lowest points performing despicable acts. Fluid and sensuous prose carry the narrative forward effortlessly; the time it takes to read the book becomes irrelevant. 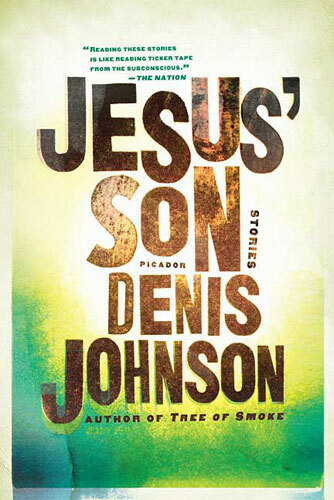 This was my first time reading Denis Johnson’s work, and not knowing anything about him, I wondered if these vivid stories were pulled from real-life experiences. Either way, I was captivated. Johnson makes a hospital orderly moving through his day in the story “Emergency” on a drug high sound warm and simple. He seemed to have reached a heightened state of bliss among a bleak and stressful world, while the dire risks of his actions were always prevalent. This entry was posted in Book Review, craft-based annotation, fiction, MFA Writing, short fiction, writing craft, writing style. Bookmark the permalink. David, you’re really ringing some bells here. You have zeroed in on a particular aspect of Johnson’s prose: his ability to use descriptive prose to bring alive a fictional reality that is simultaneously outrageously bizarre and utterly plausible.I believe you are right on the money to point out that Johnson’s protagonists’ lack of awareness, their “sense of bliss,” is one of the things that makes many of these stories so compelling. We know the risks. We know bad things are going to happen to these guys. They often don’t. What’s unusual about Johnson is that the “sense of bliss” is very often drug-induced. Drug literature is so interesting because it deals with altered perceptions in a way that another medium such as film could never put across. Johnson is one of the best drug writers I know, and you’re right, he’s able to transcend the clichés in a very big way. Is this because of personal experience? Probably, although I doubt that any of these stories are autobiographical in a literal sense. Bravo to you for noticing Johnson’s amazing gift for, as you so nicely put it, “deliberate figurative prose.” What a great insight that he’s able to make the link between the existential state of his characters and the landscapes he moves them through. This is a profoundly important thing for a writer to notice. Note that the descriptions are slanted too, and never obvious. They reflect and refract the characters’ consciousness in a way that makes the world seem bizarre and strange, but never in a way that feels anything but natural. I think Johnson is at heart a poet, or, at least, he has a great poet’s grasp of what is sometimes called “negative capability” – the skill of being able to squint one’s eyes as one is writing enough to let the subconscious mind take the keyboard. Anyway, well done. You have clearly internalized and digested an important aspect of what makes Johnson such an amazing writer. I am quite confident that you’ve take something out of this exercise that will eventually surface in your own work as well.